With six seconds left in the game, Michigan managed to score and make their way into the Elite 8. Caris LeVert #23 of the Michigan Wolverines shoots the ball against the Tennessee Volunteers in the first half during the regional semifinal of the 2014 NCAA Men's Basketball Tournament at Lucas Oil Stadium on March 28, 2014 in Indianapolis, Indiana. With 6 seconds left and trailing 72-71, Cuonzo Martin would probably send the ball into Jarnell Stokes, who would try to back into the post or drive. 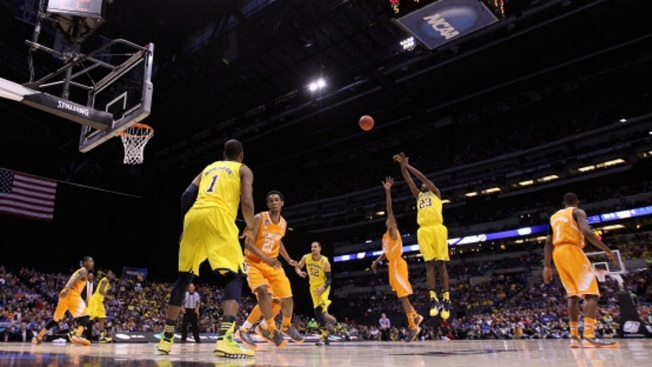 Beilein urged his defenders to buckle down and keep Stokes away from the rim. Jordan Morgan, who scored 15 points, heeded his coach's advice and stood his ground until Stokes lowered his shoulder. The senior forward immediately crashed to the floor — perhaps embellishing the contact — but drawing the call that saved the game for Michigan and infuriated Tennessee's "Rocky Top" contingent. Big Ten player of the year Nik Stauskas made a late free throw and nobody was more relieved than Beilein when Jordan McRae's 70-foot heave fell harmlessly to the floor as the buzzer sounded on a 73-71 Michigan victory. The Wolverines (28-8) have won 10 of their last 11, none as tenuous or excruciating as this one to set up a Sunday showdown against eighth-seeded Kentucky, the 2012 national champion. The Wildcats won 74-69 over fourth-seeded Louisville, which beat Michigan in last year's national championship game. Tennessee almost pulled off one of the most stunning comebacks in recent regional memory. With 10:55 to go, Spike Albrecht's layup gave Michigan a seemingly insurmountable 60-45 lead. When Stauskas made the last of his three 3-pointers with 3:40 to go, the Wolverines still led 70-60. Stauskas finished with 14 points. For some reason, Michigan went into panic mode and, just two weeks after nearly blowing two big leads in the Big Ten tournament, they nearly threw this one away. The Volunteers staunch defense limited Michigan to just one basket over the final 3:40 and forced four turnovers in the final 97 seconds to give themselves a chance in the closing seconds. "I don't think I fouled him," said Stokes, who had 11 points and six rebounds after two straight double-doubles. "But it was a smart play for him to try to take the charge. He pretty much anticipated it." Just as Beilein had predicted. For most of the night, Michigan relied on its shooting stars to stay in control against a defense that had allowed just 54.0 points in its previous eight games. The Wolverines took a 13-point lead in the first half and still led 45-34 at halftime because they were shooting 61.5 percent from the field and made 7 of 9 on 3-pointers. Michigan didn't slow down early in the second half, either, taking the biggest lead of the game at 60-45. But somehow Tennessee played itself right back into the game. The 11th-seeeded Vols, who had a first-round game in overtime at Dayton, Ohio, just to start their surprising postseason run, cut the deficit to 62-56 with 6:45 left. They got within 72-67 when McRae completed a three-point play with 1:56 to go. They made it 72-69 when Josh Richardson scored the last of his 19 points on a layup with 24.6 seconds left. McRae's layup following another Michigan turnover made it 72-71 with 10.8 seconds remaining. So when the officials ruled Michigan's Caris LeVert caught the ball with one foot on the baseline and 9.6 seconds left, Martin made the smart call by giving Stokes a chance to win it with a basket or draw the foul. "We got the ball to Jarnell. Jordan set a screen for him to get him right to isolate him, attack him in the middle," Martin explained. "Obviously we got the ball where we wanted." However, the call went against them. "We heard all week about they had mismatches and how we couldn't guard them inside," Morgan said after letting out a scream at the end. "We're not really soft around here. That's not who we are."